Explore the Caribbean like never before aboard the classic 236ft sailing vessel Mandalay. Let us sail you to beautiful un-spoilt beaches and idyllic islands in a relaxed atmosphere while enjoying the many luxuries we offer aboard including full cabin service, air conditioning, delicious local cuisine and our famous rum swizzles. and possibly other spots along the way! We’ll sail you safe and steady to unspoiled beaches, hidden inlets and sparkling warm waters that conventional cruise ships just can’t reach. Experience a Caribbean few others ever see or even dream. 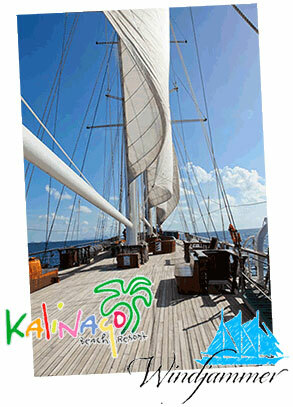 Partake in raising the sails, take a turn at the helm or just enjoy the winds of the Caribbean sea filling the sails. The choice is yours! Palm-fringed, white sandy beaches offer you tranquility and relaxation that will have you living your Caribbean dream and unwinding by the minute.